Mr. Play is one of the newest casinos in the industry. Set up in December 2017, Mr. Play is a fully licensed site that is regulated by both the UK Gambling Commission and the Malta Gaming Authority, two of the most respected gaming jurisdictions in the world. 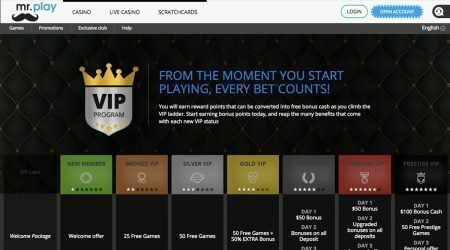 Although it has only been operating for a relatively short time, it has quickly built up an excellent reputation among online casino gamers due to its slick presentation, selection of top-rated games and player-friendly loyalty scheme. In this review, we will be putting Mr. Play under the microscope, covering everything from the quality of the welcome bonus to the speed of the site’s banking options, to give you the complete low-down on this new operator in the casino world. Many online casinos, particularly new entrants to the market, focus on drawing in new players with eye-catching welcome bonuses. While Mr. Play doesn’t fall short in that department, it particularly excels when it comes to looking after regular players, offering an impressive loyalty scheme. The welcome bonus is an important part of any online casino operation. 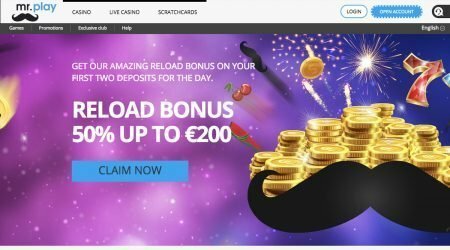 Players are bombarded with tempting bonus offers every time they go online, and new casinos are particularly keen to grab new customers by providing the best bonuses around. While Mr. Play’s strength lies in the way that the site looks after regular customers, it also provides an extremely competitive welcome bonus offer, consisting of an initial bonus and free spin package. New players who complete the straightforward registration process and make their first deposit will find their deposit matched 100%, right up to a maximum of £200. This is a great deal, and far better than most comparable online sites. In addition, at the time of their first deposit, new players will pick up 20 free spins to use on Mr. Play’s wide selection of slots titles. 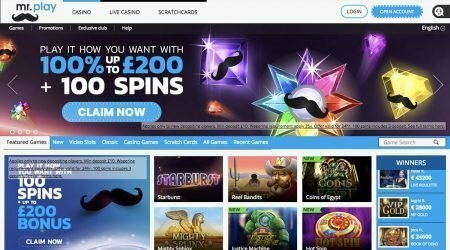 Mr. Play’s most notable feature is the way that it looks after regular players – unlike some sites that only offer one bonus at the time of initial deposit, this site continues to reward new customers with additional 80 free spins, awarded to players who make a second and third deposit of £20 minimum, which are credited in two batches of 40. The free spins can only be used with the Starburst slots game, and to qualify, players have to make their initial, second and third deposits on consecutive days, but it still rates as a good deal. In a highly competitive online casino market, this welcome bonus package is one of the best you will find, and will certainly tempt new players to sign up. Wagering requirements is a phrase that no online casino player likes to read. Unfortunately, wagering requirements are a fact of life for anyone who plays casino games online, and you won’t find any casino that doesn’t have some form of requirement attached to its bonus offers. However, by the standards of the online casino industry, the Mr. Play wagering requirements are fair. Before you can withdraw any winnings that you earn using the welcome bonus, you will have to wager the total amount (bonus and deposit) 35 times. This compares well to some sites that have wagering requirement multiples of 40 or even 45. As with most sites, not every game that you play counts fully towards meeting the wagering requirements, but taken as a whole, the Mr. Play offer is fair. As well as the welcome bonus, another important aspect of modern online casinos is the way that they look after regular players, and this is where the Mr. Play site really comes into its own. Whereas some sites offer only sporadic additional promotions, at Mr. Play there are ongoing regular and concurrent promotions, which include everything from Free Spin deals to Live Blackjack Marathons. The list of available promotions changes frequently, which is a good way to ensure that players return to the site on a regular basis to check out what deals are available. In addition to the array of ad-hoc promotions and deals, Mr. Play also operates a traditional loyalty scheme, through which players accumulate points every time they make deposits and play certain games. The top two levels of the scheme are considered to be the casino’s VIP club. Members of the VIP club will pick up additional perks, including more generous cashback offers, extra free games at the weekend, upgraded deposit bonuses, and a personal account manager, who will also be able to offer them deals tailored to their needs. Even if you don’t rise to the level of VIP, the Mr. Play loyalty scheme appears to have been designed with the casino player in mind, and with regular additional promotions available, the overall package for those who use the site regularly rates as one of the best in the industry. You can often judge an online casino site by the depth and range of its game library, and while Mr. Play doesn’t have the enormous catalogue of slots titles that you will find on some sites, it has a wide and varied selection of more than 250 games, which should keep most players entertained. The site performs particularly strongly when it comes to slots games. These dominate the Mr. Play game selection and include an impressive variety of slots, from classic three-reel titles to the latest in high-definition, immersive and 3D games from the top developers. In total, there are more than 150 video slots games, with another 40 classic slots. The collection includes well-known titles such as Dragon Wins, Sea Hunters, Life of Riches and Twin Spin Deluxe, as well as popular games such as Starburst, Fruity Friends, Gonzo’s Quest and Thunderstruck II. There are also a handful of high-paying progressive jackpot titles on the Mr. Play site, all of which provide players with the chance to win a life-changing prize. Fans of table games are also well catered for with a selection of popular titles, including roulette, baccarat and blackjack, along with scratch card games and a live casino section. The live games come courtesy of leading casino software developer NetEnt, which has a reputation for the quality of its immersive live titles. The full roster of live games offers varieties of blackjack, roulette and baccarat, including Live French Roulette, Live Auto Roulette and Live Roulette VIP. 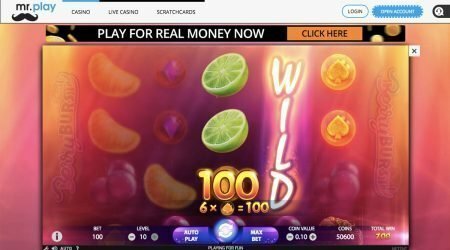 Although, as mentioned above, there are sites out there with a bigger selection of games, the operators of Mr.Play have put together a collection of titles that covers all the bases, and whatever your level of casino gaming experience, you will find something to entertain you on this site. It is important when you’re choosing an online casino to consider whether it supports your preferred payment method. This shouldn’t be a problem with Mr. Play as the site works with 19 different banking methods. Not all of these can be used for both deposits and withdrawals, though the most popular options can be used for both types of transactions. When you make a deposit at Mr. Play, there is no fee attached, and all deposits are instant apart from those made through Bank Transfer, which can take up to six days to appear on your casino account. As with all casinos, the withdrawal times vary according to the banking method you use. For example, if you use e-wallets such as Skrill and Neteller, then withdrawal times can be up to three working days, while for debit cards, there can be a delay of up to six days. Casino players will be reassured to learn that Mr. Play employs 128-bit Secure Socket Layer encryption to ensure that sensitive data is kept safe, and for UK customers, all card transactions are handled by AG Communications Limited, which is also licensed by the UK Gambling Commission. When it comes to keeping your financial details safe, there are few more secure sites around. It is reassuring to know that you can get reliable assistance from a casino site’s customer support team should you encounter difficulties, and Mr. Play provides one of the best customer service operations in the online industry. The support team members are highly trained, friendly and responsive, and can be contacted through email, phone and live chat between 06:00 and 23:00 every day. In addition, there is a comprehensive FAQs section that deals with many common queries. Mr. Play has made an impressive start for a new operator in the competitive online casino world. The selection of games that it offers covers all the most popular options, and when it comes to looking after its players, Mr. Play has one of the best welcome bonus and loyalty scheme packages you will find. The site is slickly designed, runs smoothly on both desktop and mobile devices, and is boosted by top-quality customer support and a range of flexible banking options. This is a site that has clearly been designed to focus on the player, and as such, is highly recommended.